I tasted strawberry cream cake for the first time in a birthday party 2 years back and ever since I have wanted to create an eggless version of it. And I finally did it for my husband’s birthday last month. It has been two years since I baked a cake for my husband’s birthday. The last one I did was this vegan white cake. So I wanted this year’s cake to be really good. I was in a huge surprise when I tasted the cake. It was an awesome surprise though. The cake turned out fantastic. The texture was absolutely great and the taste was simply superb. I had finally nailed down the missing element of a moist cake. 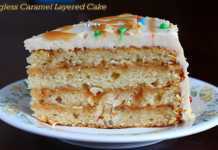 The cake recipes I have posted here are definitely great. I do not post mediocre recipes. But I did not like that some of the cakes started drying when stored in the refrigerator. I didn’t know what I was doing wrong because I was following all recommended tips for storing it in the fridge. 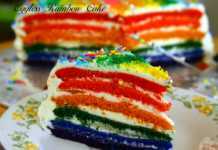 I have seen a couple of cake recipes, where the recipe suggests to brush the cake with simple sugar solution. I really didn’t realize the full effect of it until I tried it myself in this strawberry cream cake. All these days I was thinking it was something fancy and totally unnecessary. Only now I realize that it is actually for a valid reason. It is done to keep the cake moist for days together. I was not planning to try this trick in this recipe. I wanted to use up the strawberry-sugar syrup which was a by-product while preparing the filling. First I thought I would store it in the fridge to make this strawberry milk and then all of a sudden I had this light bulb flashing in my head telling me to brush it on the cakes. Thank God that my brain works efficiently at least some of the time! The cake remained moist even after 3 days in the fridge. With my other cakes, I used to bring the cake to room temperature before serving, for it soften up a bit. But I was able to serve this cake directly from the refrigerator. If I remember right, this is the third time that I was very excited about my creation. The first time was when I baked this eggless chocolate cake using silken tofu, the second time was when I baked this eggless blueberry pound cake, finding out the best combination of egg substitutes for cakes and this strawberry cream cake is the third time. I got the idea to make a strawberry cream cake from this recipe but I decided to stick with my awesome fail proof eggless pound cake recipe. The trick is to use 50% each of pureed silken tofu and yogurt instead of eggs to get the amazing texture of cake with eggs. I also referred to this recipe for preparing the filling and whipped cream topping. Note: Factor in the time required for the strawberries to macerate for the filling, freezing the bowl and beaters for preparing the whipped cream frosting and for the cake to soak up the strawberry-sugar syrup while setting out to make this recipe. Want to impress your special one or guests with an elegant cake? 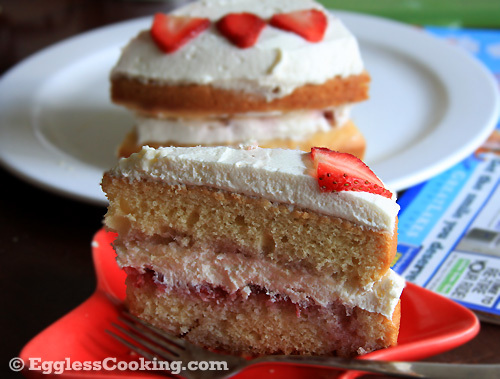 This eggless strawberry cream cake is the answer. You can’t go wrong with a moist eggless sponge cake, filled with fresh strawberries and topped with homemade whipped cream. In a large bowl mash the strawberries and sugar lightly with a potato masher. The amount of sugar will depend upon the sweetness of the berries. Set it aside for 30-60 minutes. Preheat the oven at 350F/180C for 15 minutes. Line two 9-inch round cake pans with parchment paper. In a medium bowl mix together the ingredients listed in Part 1 and set aside. In another bowl sift together the Part 2 ingredients. Add the dry mix and combine well. Divide the batter between the 2 pans. It’s about 2 cups of batter per pan. Bake for about 21-23 minutes or until a toothpick inserted in the middle of the cake comes out clean. Transfer the pans to cooling racks. Since we have lined the pan with parchment paper, the cake should come off the pan within 15 minutes. Let it cool completely before frosting. Place the cream, sugar and vanilla extract in the bowl and whip until stiff peak forms. I first started with 2 cups of cream and 1/4 cup of granulated white sugar. I felt that the cream was not sweet at all. I started adding a tablespoon of icing sugar and whipped it again and went on adding another 3 tablespoons of icing sugar. That’s when I felt it was sweet enough. So it’s your choice to add or not to include the additional icing sugar. Level the cakes as always to remove the dome and flatten it. The prepared strawberry filling would have secreted water and you would have got a strawberry-sugar syrup. Spoon out the strawberries and set it aside in another bowl. 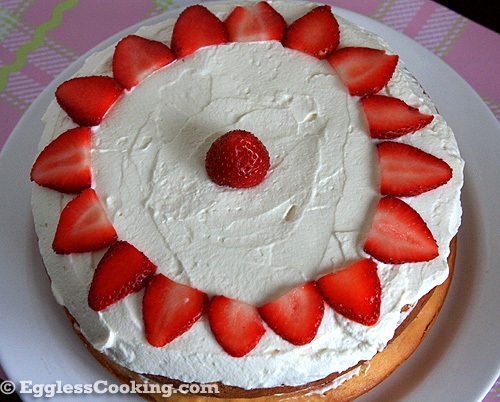 Use the strawberry syrup to brush the leveled cakes, so that the cake will absorb it and be moist for days. Do not fear of too much syrup on the cakes. The cake will keep absorbing it. 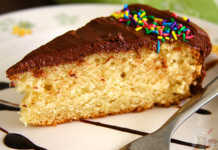 Before brushing it with syrup, try to dust off the crumbs from the leveled side of the cake using a dry pastry brush. Now pour the syrup directly over the cakes or use a pastry brush to dip the syrup and brush it on the cake. Leave the cakes to soak the syrup for at least 15 minutes. Soaking it for more time is fine too. Place one cake on a serving platter or cake stand. The neat and flat side should be on the bottom and the syrup brushed side should be on the top. 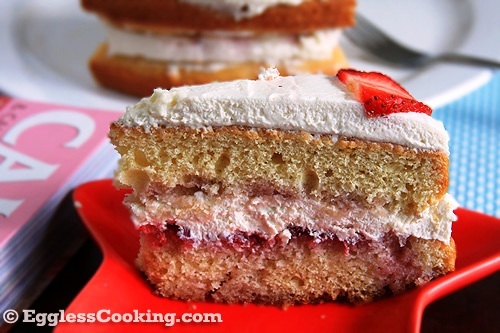 Spread the strawberry filling on the cake and cover it with half of the frosting. Place the other cake on top of the filling. The syrup side should be facing down and the smooth side should be on top for this one. Cover it with the rest of the whipped cream and garnish it with whole or sliced strawberries. Following the other strawberry cream recipe, I used 1/3rd cup of orange juice for the cake. But the cake did not have the flavor at all. So do add orange zest to the batter if you want an orange flavored cake otherwise stick with plain milk instead of orange juice. If you can’t find strawberries or if you want a shortcut for the filling, spread a layer of strawberry jam. Similarly you can use store bought whipped topping if you don’t have the time to make it at home. Add another cup of whipping cream if you want to frost the sides of the cake too. Hi, I want to try this recipe. Can we replace silken tofu with cottage cheese? Or any other alternatives you can suggest? Cottage cheese won’t be a good substitute for tofu. Maybe some more of the yogurt itself. Hi, I made this cake as well for my daughter birthday party. I used APF. I did not have silken tofu so used greek yogurt instead of that. The mix was very thick, it was not in pouring consistency. It added more liquid and the cake was not very fluffy. Could you please help me understand if we can replace tofu in this recipe and also what change should we do if we use APF instead of cake flour? This cake won’t be very fluffy Raji. Especially that we are brushing it with sugar syrup. Also using all purpose flour might have affected the texture a little bit. In that case you should have added a teaspoon of apple cider vinegar and it could have helped to get a better texture. It is supposed to be moist. Yes Greek yogurt being very thick it might have needed some more liquid to get the correct batter consistency. Thanks a lot Madhuram for your prompt reply! It is great to get the suggestion from an expert. Love your blog. Hi, I tried the cake and it turned out good but was wondering if there is any way we can make the texture more moist? Did you miss the sugar syrup coating step? Because if you do that the cake is so very moist. Thanks so much! Just served this cake for my little guy’s first birthday party (he’s allergic to eggs). It was a big hit! For his smash cake, I baked a 1/4 recipe in a tall (2 inch high? ), 4 inch diameter pan, & split it in half to make a layer cake. He managed to put away a significant portion of it! The grown ups enjoyed their regular sized cake too :). I really want to try this recipe. I get rave reviews from my friends on your moist chocolate cake recipe w/ silken tofu. Always a HUGE hit! Do you think it be ok if I used 1/2 cup of canola oil instead of butter? Curious why you chose to use butter in this recipe. Thank you for all your amazing recipes. Thanks Susanne. The original recipe used butter so I went with it. But I usually see butter being used in white/yellow cake recipes and oil in chocolate cake recipe. I could put in the pan.Where did I go wrong? All the liquid ingredients mentioned are enough ? Am I missing anything? Hmm…If you followed the recipe to the T, I can’t guess why the consistency was like that. Should the consistency of yogurt be like water/milk ? I think it was more like yogurt only. Even i have tried making this cake twice. The taste is awesome but as Prachi says the consistency is very thick. When i used a 9 inch bake pan the layers came out thin (not usual height of layer cakes). So am planning on an 8-inch when i try next time. But ya it is not the pouring / flowing consistency. Yes it’s a thin cake for a 9 inch layer. Hi. Tried this recipe and it was very good. First time I saw a recipe using tofu/yogurt combo for egg replacement! Nice. The marinated strawberries were amazing in the cake!! However the texture of the cake was dense n a bit dry. Did I over cook it or did i not have enough strawberry liquid for absorption? Any suggestions for improvement. Or maybe you brushed in too much liquid. Not able to guess Preshita. I did this for my son’s fourth b’day and it turned out very well. I modified the recipe a little to use 1/3 cup oil + ghee instead of 1/2 cup butter as the last time I tried with butter (pineapple cake) the texture turned out a little crumbly. This time, with the oil and ghee, the cake was absolutely moist. Also, I used fresh strawberry juice instead of orange juice and added strawberry pieces into the cake batter. I have tried other recipes from your site and have found them to be very good. Thank you so much for such wonderful recipes. Can you adapt this to a larger rectangle pan for a bigger cake? I have tried it in a 13×9 inch pan. That’s the biggest I have gone. Use the whole recipe for one rectangular cake. If you are doing layers then use another full recipe for another cake instead of slicing the one cake into halves, because it might slice too thin. My son loved this the last time I made it, and wants it for his birthday – but I need more than a 9 inch round. Any suggestions to use the same recipe for a rectangular cake? I am thinking I will just have to make two batches? One batch for each layer? Use the recipe for one 9×13 inch cake. So you will have to bake it twice.